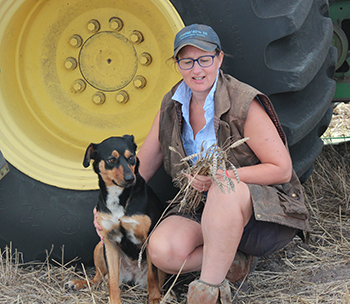 Sixth-generation Australian farmer, Odette Suitor, is one of three Victorian finalists for the national 2019 AgriFutures Rural Women’s Awards. The awards celebrate female leaders living in rural and regional areas across Australia. Our state finalist, to be announced on 21 March, will receive $10,000 to implement her project, while the national winner will be chosen on 11 September. Odette – who grows canola and wheat and runs cattle on 2000 acres from Atwood to Heathcote in Victoria – has spent seven years devising a grain storage system using stacked shipping containers, and it was this concept that captured the judges’ praise. The idea stemmed from her personal frustration about lengthy delays from trucks returning from grain receival sites, and the fact that receival site opening hours weren’t conducive to harvest (such as closing on weekdays at 4:30pm and not opening on weekends). "There’s room for improvement in the efficiency of the supply chain," Odette says. "The grain is worth hundreds of thousands of dollars, so these hold ups are costly: efficiency improvement would mean significant savings for grain growers." Odette came up with her idea by drawing on her corporate experience, including seven years at agricultural company, Elders, as well as working at a grain export company, sending 600,000-plus tonnes of grain through the supply chain for export. Her system is aimed at growers needing to store over 500 tonnes of grain. Since building the first prototype her system has undergone various improvements and is now ready for consideration by clients for the 2019/20 harvesting season. "I built the first prototype in 2012 and have been chipping away perfecting the design ever since," Odette says. "The second prototype, built on my farm, has enabled me to visualise and work through the design to improve it to be ready to release to market, which is the stage I’m at now. It could be international one day, however we’ll start nationally and see how we go." Grain stored using Odette’s system has zero storage fees – as opposed to grain stored in bags or in silos, which require storage at grain receival sites before sale. This means her system has potential for significant savings per tonne to growers. Odette’s system allows the chaser bin (or grain cart) to move directly into the grain storage system, eliminating the need for trucks to take grain to receival sites. Added to that, her system keeps out common pests such as mice and insects, which can chew holes in grain bags, degrading quality. And her system allows growers to separate higher quality grain from lesser grades or different varieties, and to store it for as long as necessary to secure the highest price. This year is the first time Odette applied for an AgriFutures Rural Women’s Award: it was a case of first time lucky. "I saw an ad in a local paper and thought it’d be helpful to take my concept to industry," she says. "I love farming communities and the farming industry and I’m striving to make a difference. I want to be financially successful and then plough funds back to young people in rural communities, so they can continue to develop the communities I’ve always loved."